A primary issue in the field of inflammasomes is to understand how ligands derived from vacuole-residing or extracellular microbes reach the host cell cytosol and trigger inflammasome assembly. During my post-doctoral training others and I identified several interferon (IFN)-inducible GTPases, namely guanylate binding proteins (GBPs) including GBP-2, as host microbicidal effectors promoting the release of bacterial LPS and DNA and their subsequent detection by the caspase-11 and AIM2 inflammasomes, respectively. These findings provided a novel conceptual framework in which to think the interlinks between cell-autonomous immunity and the sensing of microbial ligands. These data suggest that among the more than 2,000 genes expressed upon IFN stimulation, additional effectors are most likely involved in the regulation of inflammasome activity. In this context, a siRNA pre-screen has identified two ISGs as crucial modulators of inflammasome activation upon bacterial infection (S. Typhimurium), namely Irgm2 and RabGDIα. Beside its interferon inducibility and its putative GTPase inhibitory domain, there is no study describing a functional role for Irgm2 in both resting and activated macrophages (e.i. infected, stimulated, differentiated…). In order to identify the function of Irgm2 at regulating inflammasome response, we have used a wide set of bacteria (e.g. Gram+, Gram- and mycobacterial species). All microbes selected trigger different inflammasomes, hence allowing identifying which inflammasome(s) is/are controlled by Irgm2. 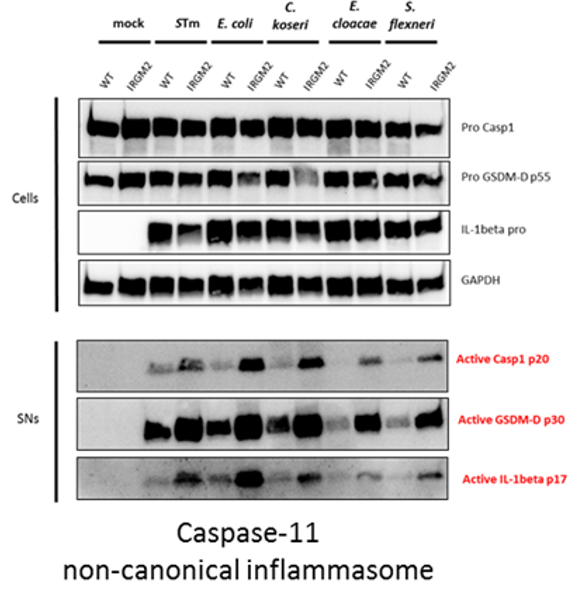 Infections or stimulations of macrophages with various inflammasome triggers identified a crucial function of Irgm2 at controlling the LPS-induced caspase-11 non-canonical inflammasome. Further investigations revealed that Irgm2 expression inhibited the recruitment of the GTPases Guanylate Binding Proteins (GBPs) at the Gram-negative bacterial membranes, which led to a strong reduction of the non-canonical inflammasome response. In addition, mice models of LPS (OMVs)-driven sepsis highlighted Irgm2 as a central locker of caspase-11 non-canonical inflammasome-induced mice mortality, cytokine production and cell necrosis (Figure 1). Figure 1: Irgm2 restrains the non-canonical inflammasome activation threshold. 1/ Western blot analysis of inflammasome activation (caspase-1, gasdermin D) in macrophages treated with Gram-negative bacteria. Another issue in the inflammasome field is to believe that inflammasomes only trigger host protective response against infections. Yet, HIV-1and both bacteria Helicobacter pylori and Pseudomonas aeruginosa benefit from inflammasome response, which promotes the infection to settle. Here we studied the host and the microbial features that make inflammasomes to drive host-detrimental responses upon Pseudomonas aeruginosa infection. Here, we show that the opportunistic bacteria P. aeruginosa localization dictates divergent inflammasome-induced host responses. P. aeruginosa-activated NLRC4 inflammasome occurs through T3SS-dependent and -independent manners. NLRC4 inflammasome-induced pyroptosis specifically entrap intracellular P. aeruginosa.